classes to talk about changes to his website, Gapers Block. 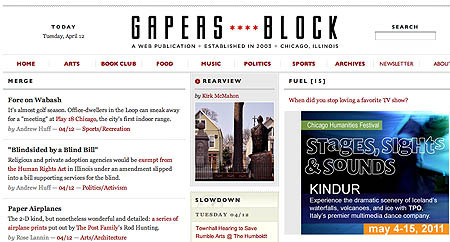 Gapers Block, a website that focuses on interesting goings on in Chicago, is being redesigned. Since its founding in 2003, Gapers Block has used Movable Type, a weblog publishing program, “and it shows,” said founder Andrew Huff. Huff spoke to journalism students recently at DePaul University's College of Communication about how the site started and how it is changing along with the media landscape. As the years have gone by, the site has gone through many redesigns and therefore picked up bugs. Gapers Block will be redesigning to eliminate those glitches. The site will be staying with its three-column front page design, but sections will be moving around. The “Slowdown” section, which is a list of events happening in Chicago, will be moved to the right column. A new section will be added in the center that will have a constant flow of the articles posted to the site and will be updated as posts occur. The “merge” section will stay where it is and continue to link readers to other sites. Gapers Block was created to encourage people in Chicago to slow down and look at the different things going on in the city, Huff said. From that came the inspiration for the name of the site, which is a Chicago term for the pile-up of traffic that occurs when drivers slow down to look at an accident. 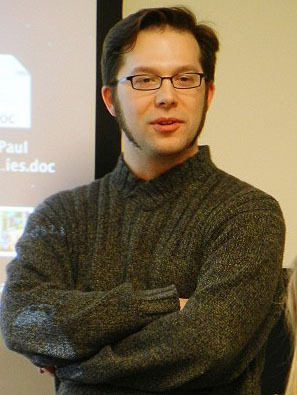 Huff, who started blogging in 2001 with his site me3dia.com, is now one of the 1 percent of oldest bloggers on the Internet. Yet he sees Gapers Block not as a blog, but as an online magazine. The posts, instead of following the blog format of mostly opinion or a personal account of events or happenings, follow a news format with some personal voice and flair thrown in. In 2006, the site made enough money that it needed to become a Limited Liability Company. The rest of that year was used to figure out the technical aspects of becoming a company, such as payroll and taxes, Huff said. Gapers Block won a $35,000 grant from the Chicago Community Trust in 2009, which the site uses to pay writers for specific stories. The site employs 90 writers on a volunteer basis and eight editors, who are paid from the advertising revenue brought in because of the half- million page views per month that the site receives. “Most of our writers don’t have a base of journalistic background but have an interest in writing,” Huff said. “The lines between blogging and journalism are continuing to blur and I think that’s a good thing. Huff said he hopes that in the future, Gapers Block will continue to snugly fit in the community of blogging and journalism where it currently resides.